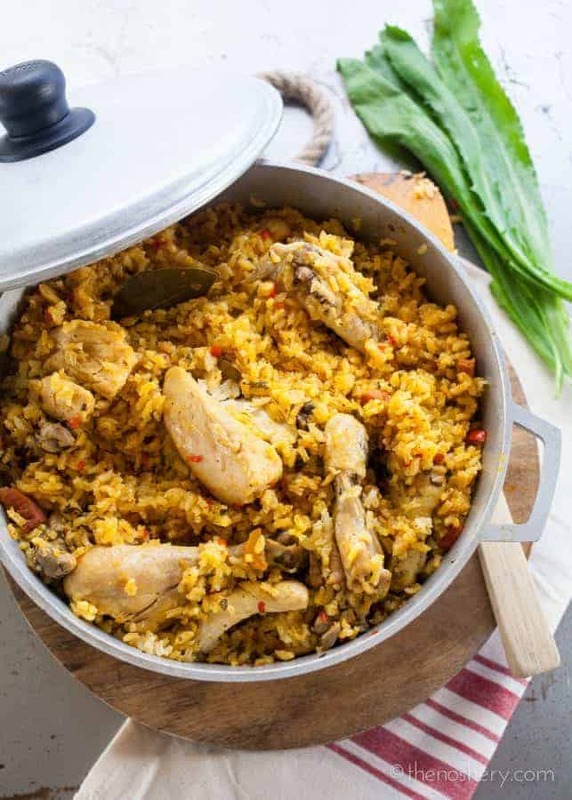 Arroz con Pollo | Do I have a treat for you! We all have a dish that brings up feelings of nostalgia and comfort. For me, it’s always a toss-up between fricase de pollo (chicken fricassee) or arroz con pollo (chicken and rice). Arroz con pollo made a regular appearance throughout my childhood. I loved to come home from school and be welcomed by the aroma of savory rice and chicken. What’s not to love? 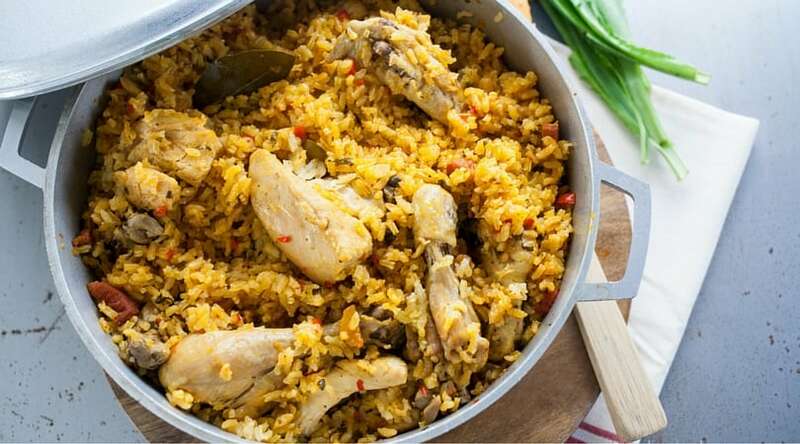 It’s a one pot wonder where the chicken is cooked in the rice making it a quick and easy dish that adults and kids love. Although chicken and rice is a classic Puerto Rican comfort food many Latin countries have their own versions of arroz con pollo. The seasoning, types of rice and aromatics may vary but, they all have chicken and rice. Clearly, I am biased but I believe that arroz con pollo boricua is the best. Every Puerto Rican recipe starts with a base of sofrito, medium grain rice, and annatto oil and it’s prepared in a caldero The sofrito give the dish it’s flavor and the annatto oil gives it its golden color. I love this one pot wonder! It’s the best arroz con pollo recipe. Just like abuela made it. The trick to this dish is layering flavors on top of flavors. Although this is a one-pot dish, layering the flavors gives every element of the dish a chance to develop. It’s important to take the time to layer and develop flavor to keep the flavors of this one-pot dish from being muddled. This is why it’s important to take the time to saute the vegetables, brown the chicken, and toast the rice. I typically will get a whole chicken and break it down but if you prefer you can use chicken thighs. do you need to rinse rice? When I was a kid watching my mother make dinner, she would always rinse the rice. When I got older, I thought that this step was more of a learned habit than a necessary step. But, I quickly realized that this is a very necessary step. Rice straight out of the bag is coated in excess starch, and that added starch will make your rice sticky if not rinsed. Puerto Rican chicken and rice is not meant to be sticky; it should be light and fluffy. Sofrito is the heart and soul of Puerto Rican cuisine. It’s our version of mire pox or the holy trinity, except there are way more than just three ingredients. 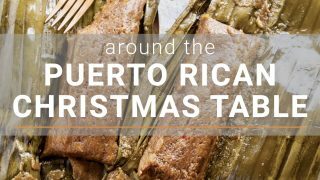 It is the base of many Puerto Rican dishes and leaving it out when it’s called for is not an option. I am a firm believer that homemade is superior to store bought, so I choose to make my own. But, that does not mean I never use store bought. Sometimes there isn’t time to make it, and store bought is acceptable. what kind of rice for arroz con pollo? Puerto Rican rice is made with medium-grain rice…the end. The problem is that in the states medium grain rice can be hard to find. But, thanks to the power of the internet you can have a bag delivered to your door. Which is what I did when I lived in Tulsa. Why do we use medium grain rice? It’s all about the texture. Short grain rice produced rice that is too sticky, and long grain makes very loose rice. We like our rice somewhere in between. Toasting the rice in drippings or oil helps to keep the rice loose and fluffy. Do not over stir the rice when toasting. You want to allow it time to toast and create a thin barrier from the liquid that helps towards optimal fluffiness. You want to toast it until it’s just beginning to brown. Also, if you want the coveted “pegao”, which is the crusty toasted rice at the bottom of the pot, you have to make the rice in a caldero. After the last stir of the rice while toasting and before adding the liquid add a little more oil and let the rice toast until it starts to stick to the bottom. Finally, add the liquid and cook as instructed cooking for 10 minutes longer allowing the rice to get crispy on the bottom. Keep an eye on it! You want it to toast not burn. Making pegao is an art not everyone gets it right for the first time. how much water for arroz con pollo? The standard ratio of rice to water is 1 to 2. Therefore, for every 1 cup of rice, you use two cups of water. However, when it comes to chicken and rice I have found that that ratio isn’t quite right. The issue is that the added ingredients such as sofrito and chicken and rinsing of rice equal to added liquid. I have found the ratio of 1 1/4 cups of water per cup of rice works better. This is something that my grandmother and mother-in-law taught me, and it works for me every time. A tight seal when steaming the rice is essential! Back in the day, a plantain tree leaf would be laid over the rice and covered to help create a tight seal. Nowadays we use foil. Not having a tight seal allows heat and water to seep which could result in undercooked rice. Puerto Rican cuisine has many rice dishes. It’s kind of crazy how many variations of rice there are and, it goes to show that making rice is a sort of art. Explore more Puerto Rican flavors by visiting my entire collection of puerto rican recipes. If you need more inspiration for chicken recipes visit my entire collection of chicken recipes. 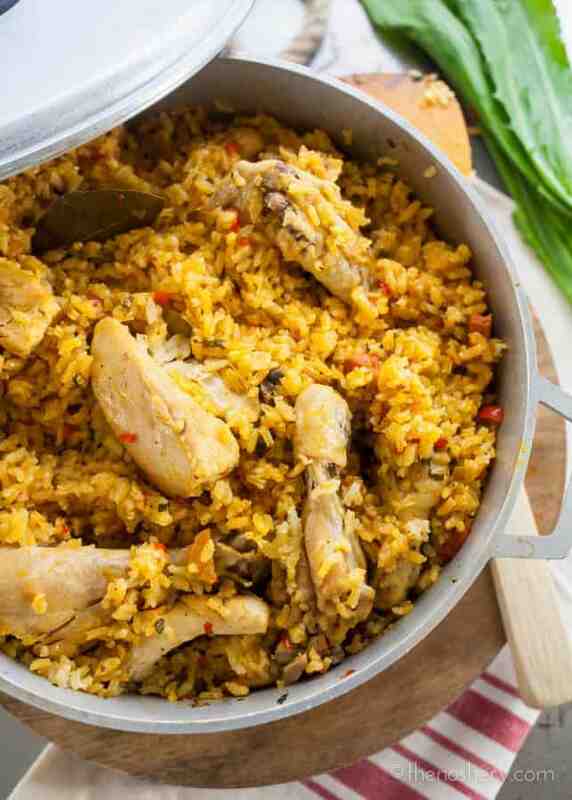 Arroz con pollo is classic Puerto Rican comfort food. It’s a one pot wonder where the chicken is cooked in the rice making it a quick and easy dish that adults and kids love. Heat the oil and seeds in a small saucepan over medium heat just until the seeds begin a steady bubble and oil turns a bright orange color. Remove the saucepan from the heat and let stand for a minute. Strain the oil. Store in half-pint mason jar. Combine adobo seasoning in a small bowl. Cut chicken breasts in half, sprinkle seasoning over all the chicken and toss until evenly coated, set aside. Heat a 4-quart caldero or shallow heavy bottom pot over medium heat. Add salted pork, chicken wings and 1 tablespoon of water. Slowly render the fat from the pork and chicken wings, about 10 minutes or until pork is crispy. Transfer wings and pork to a plate. Raise the temperature to medium-high heat. Working in batches brown chicken on all sides, about 3 minutes per side. Transfer to plate and set aside. Add sofrito ingredients and 3 tablespoons of achiote oil to the pot. Saute sofrito until tender, 5 - 8 minutes. Add rice and pork to the pot, mix until rice is evenly coated with oil. Toast the rice, stirring for 3 minutes. Add chicken to the rice and toss, working the chicken into the rice. Add 3 cups of water and bay leaves. Make sure that the chicken and rice are covered by the water. Bring to a boil and let the water reduce until the rice is just becoming visible. Cover with foil and lid, reduce heat to low and simmer until rice is cooked through, about 25 - 30 minutes. Culantro can be substituted with 1/4 cup chopped cilantro. However, if you can find culantro I highly recommend using it. Culantro can be found in the produce section of many Latin & Asian supermarkets. Click on link to learn how to cut a whole chicken : There is no need to skin the chicken wings. Rinse rice in a fine mesh strainer until water runs almost clear. When making achiote (annato) oil make sure to use whole seeds and not the powder. The powder will burn easily and clump. Learn some important tips for making Puerto Rican style rice here. I already have a batch of sofrito very similar to yours that I made and froze into ice cube measures. About how many cubes should I use? Each one is about a Tbl spoon measure. Also, can I use long grain rice instead of medium ? Thank you? I do not use tomato sauce in my arroz con pollo. That was just an error in my part. However, you can add 1/2 cup of tomato sauce if you like. Would I use dried salted pork? You can but just make sure that you rinse the salted pork. I made the sofrito/recaito you have in your recipes last week, YUMMMM, how much would I use here instead of remaking it in this recipe? Or is it better to do it again so the flavors layer like you mentioned? Thanks! If I use the store bought recaito, would I still need the Achiote Oil… Is it possible to buy premade Achiote Oil? i have never used it (or heard of it) before. Excited to try this tonight for my husband’s grandfather. Hopefully I can do it justice! Yes, because recaito does not usually have achoite oil. 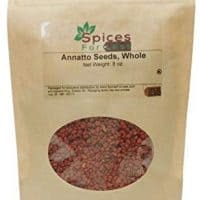 If you cannot find annato seeds you may try finding some that is ground or paste at a Latin grocery store. If you can’t find that you can use some Sazón con Achiote, which is a seasoning packet. If you can’t find it either way just skip it. It will still be ok. This has been on my bucket list for so long, and I’m so glad to have this complete guide to follow! That’s a pot of yummy right there! Such an amazing comforting dish. So many awesome tidbits of information in this post. 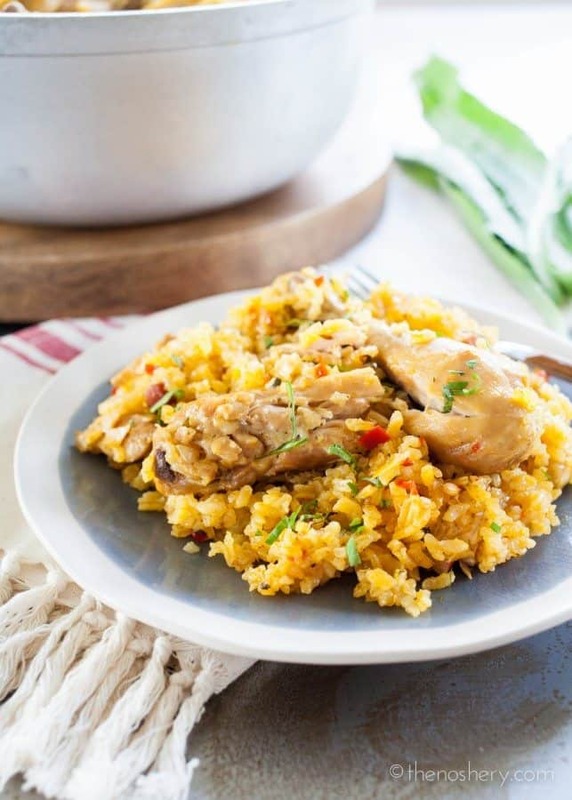 And that Arroz con Pollo looks like the ultimate comfort food! A totally amazing classic dish that I love! I just wish my kids liked rice. What a great recipe this is to have in our meal rotation! I love the balance of seasonings in this dish. Classic and delicious. Looks so easy for such a delicious dinner! Hello! I am very interested in trying this recipe but I was also wondering what form you’re referring to when you say “salted pork”. Should I use ham or bacon, or….? Thanks looks very tasty, can’t wait to try my hand in it! Salt pork can be found where you find whole or diced hams. It’s pork belly that has been preserved in salt. I’ve never made my own adobo or sofrito. You don’t use the adobo Goya bottle? Will it taste the same? The sofrito I totally get to make homemade. I use both. If you have Goya adobo you can use it and it will be fine. Would like tp try this but not sure what “salted pork” is or where to get it. Why do you cover the arroz con pollo with aluminum foil? Is this a nod to plantain leaves? 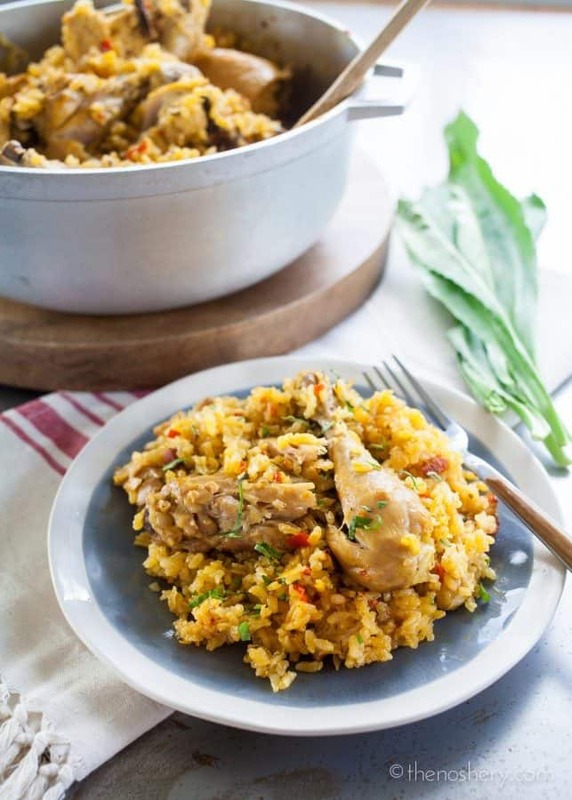 I’ve used leaves and parchment paper when making arroz apastelao but have not tried aluminum foil or other covering with the arroz con pollo. ps: I tried giving this recipe a 5 star rating but the system won’t let me. Love your detailed recipes/ Thanks! I use foil because it’s what I have access too. No easy access to plantain leaves here where I live. Foil is used to create a better seal for cooking the rice. It serves the same purpose as the plantain leaves. Yum! Followed recipe exactly and it was great! So flavorful with minimal effort. Definitely a keeper! my grandmother would offton mention a dish from puertorico called caldo santo that was a custom for easter. do you know where i can find the recepi, i would greatly appreciate this. just stumbled onto your site, felicidades!!!!!! do you know how to make a cilantro sauce I tasted it in Florida at Pollo Tropical and it tasted really good. I tried the ones in the web site but they don’t taste as good. Any suggestions I would appreciate. BTW I will be making this recipe next time my sons come over. Ooh I tried your arroz con dulce and it came out good so was the Arroz con gondolas.. Since finding your site I come here quite often. I am either looking for a particular recipe or just looking around for some ideas. I love what you have to offer and listing alternatives or uses for particular things such as sofrito compared to riccoito (spelled incorrectly). I do have one question pertaining to a rice pot. 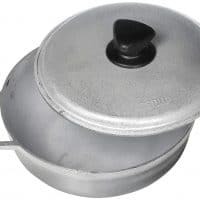 What is the best rice pot? Should it be aluminum, cast iron, ceramic? There are many listed on ebay and such but I have no idea which is best. For regular rice I use one of my regular pots with a glass lid and my white rice comes out perfectly. Can the same pot be used for that? We recently made pernil which was out of this world. Thank you so much for sharing good authentic recipes with us. I look forward to many more rewarding suppers. Rice can be made in any pot with the exception of a tall stock post. But, I find that I get the best results with an old fashion caldero. You can find a link for my favorite caldero in the notes of the recipe above. Enamel coated cast iron pots also work well.